What’s interesting about this programme is that it marks an era when people could be intelligent on television without having to apologise for it. The basic format is essentially the same as any other modern “reality” show such as Masterchef or the Apprentice in which a group of people are set a challenge with limited resources and a limited amount of time and then get to square off against each other in a final contest. But beside that basic format, all other resemblances end. Much of the programme consists of boffins muttering to each other under their breaths about how they plan to build their contraption, followed by Professor Heinz Wolff and his expert guest having discussing the week’s challenge without worrying especially about whether the audience was keeping up or not. The presenters do a rudimentary job at explaining things, but the viewer is pretty much left to it. There’s no Sean Pertwee sexily explaining what’s going on every thirty seconds. Neither is there much in the way of conflict; it is possible that they had their own equivalent of the Baked Alaska scandal, but I’m not aware of it. The most striking contrast is with The Apprentice, and I think it says a lot about how our society’s values have changed over the past 30 years. While widely mocked as a piece of car crash TV, I can’t help but think that one of the reasons The Apprentice continues to be popular is that the corporate executive is now what we are meant to believe is what the ideal job to aspire to looks like. We might not all buy The Apprentice’s portrayal of corporate suits behaving like idiots and stabbing each other in the back to get ahead, but we at least buy into it as being a caricature of something real. The Great Egg Race on the other hand is about engineers being set a similarly impossible and ridiculous challenge, who go about it by working together collaboratively and just getting on with it. They aren’t steered by the nose by producers who desperately want to drag a narrative into it all, and in the final challenge even the losers have a certain amount of dignity; they might have failed – they might even have failed badly – but even the biggest loser emerges from The Great Egg Race with a degree of dignity. And they were engineers! A profession which our modern culture appears to simply ignore. Scientists are of course lauded, especially if they’re pretty ones like Brian Cox (sorry Heinz Wolff), but engineers seem to be pretty much invisible. Yet somehow our transportation systems, computers and widgets continue to get built. There is, to be fair, a continuation of programmes which emulated the Great Egg Race. In the 90s we had Robot Wars, in which amateur engineers to pitch their robot creations against each other in a Thunderdome style arena. It was never really about the engineering however as much as it was about the occasional metallic carnage. It was an interesting programme to follow as both the robots and their builders evolved. You got to see the robots get slowly better over successive series and the builders become more and more up their own arses as their minor celebrity statuses (which appeared to involve opening the odd village fete and visiting children’s parties) reached their peaks. You would see them slowly coming out of their shells, wearing increasingly extroverted clothing. Some of them even (gag!) started to flirt with presenter Philippa Forrester (believe me when I say that this lead to some of the most excruciating television ever broadcast). Scrapheap Challenge was perhaps more of a true spiritual successor to The Great Egg Race, just on a somewhat bigger scale. In so many ways, where The Great Egg Race was tweed and elastic, Scrapheap Challenge was METAL. With the number of bikers who took part in the latter, despite the years separating the two series, the amount of hair on both was about the same – they just wore t-shirts rather than suits. But Scrapheap Challenge was ultimately a lot more like a modern reality TV show as well. Aside from the narration, there was a much greater focus on controversy and conflict, both inside the teams and between them. It did indeed have it’s own share of Baked Alaska Incidents. It was, to be fair, better at explaining concepts than its predecessor, but it was ultimately much more self-conscious about the fact that what it was ultimately about was a “boring” topic like engineering; it was certainly dressed up more. You can sort of see this in the team names; while the teams on The Great Egg Race were simply named after their place of work (Kontron Electrolab Ltd), the teams on Scrapheap tended to have jokey, ironic names like The Anoraks. I enjoyed it as a series, but it ultimately came across as a much less simple pleasure. What am I saying here? Nothing more than that I feel that in the 20 years between The Great Egg Race and Scrapheap Challenge we somehow lost the ability to celebrate cleverness for its own sake and to simply take delight in people working together to do a good job under trying circumstances. Whether “we” have lost it or TV producers merely perceive we have is of course a moot point, but watching that episode did leave me feeling oddly nostalgic. I’ve signally failed to blog about what has become known as Alan Johnson’s Nutt Sack. The appalling way in which this government is sliding into irrelevance – and how Her Majesty’s Opposition is always only too ready to act as an echo chamber on matters when this government is truly, spectacularly wrong, is both profoundly depressing and barely qualifies as news. I was interested to read Andrew Hickey’s take on the affair over the weekend. On one level he is certainly right: the degree by which drugs should be prescribed or not should not be lead by science but by the harm principle. It should be up to the individual concerned to decide for themselves if they want to take a narcotic and possible harm themselves in the process – that isn’t any of the state’s business to get involved. …at least up to a point. Where I perhaps part company with Andrew (I haven’t read all his comments I must confess) is that I think science plays a very crucial role in deciding where you draw the line between an individual making a personal choice and an addict blindly reaching out for the next fix. Just as Mill conceded that an individual should not have the “freedom” to sell themselves into slavery so we must accept that someone physically dependent on a drug is not exerting self-control. To what degree an addict is capable of making rational decisions is very much a matter for scientists to resolve. The bottom line is, science can’t give you value-free policy and ideology-led, evidence-free policy is equally pernicious. What you need are values and principles underpinning the science. Thus a liberal drugs policy would indeed start from the harm principle but it would rely on scientists to flesh out a lot of the practicalities. Yes, a truly liberal policy would probably result in most drugs being legalised but that in itself would lead to all sorts of questions. What should the legal limit for driving under the influence of cocaine be for instance? Would you go so far as to legalise crack? Do you impose a tax to pay for the externalities and if so, how do you calculate it? What should government policy be on advertising and public health information campaigns. There are plenty of things for scientists to investigate. In his slightly sarcastic defence of Alan Johnson, Andrew is very wrong in this respect: Nutt was offering scientific advice within the confines of the government’s own legal framework. Within those restrictions he was offering perfectly sound advice and pointing out its inherent contradictions. Johnson hasn’t been simply applying his own principles but besmirching the very principles which the government has for years claimed underpins the existing classification system. Ultimately, modern science poses a lot of uncomfortable questions about to what extent we can be said to exert free will. We need to engage with that debate not merely wrap ourselves in Victorian philosophy and hope it will go away. A few months ago I signed the Ada Lovelace pledge. Then, I realised I couldn’t think of anyone to write about. 10 weeks later, and with an hour before the end of the day, and I’m still struggling. As a Lib Dem of course, I might observe that many of the party’s e-innovators – Mary Reid, Lynne Featherstone, Jo Swinson (who despite an antipathy towards blogging has been an early adopter of everything from podcasts through to twitter – not to mention www.scraptuitionfees.com Back In The Day), have been women. But I’m not really interested in writing a piece of party propaganda. To be fair on myself, I struggle to think of anyone “in technology” – male or female. I could name you lots of people “in social media” but I’m not entirely sure that’s quite the same thing. Interestingly though, when I was a child I DID know lots of women in technology. My dad ran an apprentice school for the Ministry of Defence and much of my early years were spent in the Aquila Civil Service Sports and Social Club, where my parents helped run the bar and film society. I was surrounded by women in technology – both staff and apprentices. My dad would always say that one of the best feeder schools for him was the nearby girls school, Bullers Wood (years later I would go onto make friends with and have my heart broken by lots of Bullers girls – so much more interesting than the sappy Newstead girls). When Thatcher decided to shut these apprentice schools down and make polytechnics into “universities” I can’t help but wonder if we lost something in the process. By making engineering an academic subject, have the less academic girls had their options limited to hairdressing and shop work? And can science and engineering compete with languages and English literature for the academically-minded girls? Apprenticeships used to exist as a means of escape for a lot of young people (male and female) who couldn’t bear the idea of spending another day in school. Now everything seems either school- or college-like. As such we are now talking about bringing back proper apprenticeships (as opposed to “new” apprenticeships). But unless we are prepared to pay for actual, proper apprentice schools (as opposed to schemes running out of FE colleges), will it actually cater for the evident gap in the market? I’m totally rambling on a subject I am distinctly inexpert on. But I do wonder if, at a time when we are likely to see massive unemployment rear its ugly head once more, the time for such schools may have come again. Finally, a brief word to the WISE – that’s Women In Science, Engineering (and Construction). WISE is a campaign aimed at promoting science and engineering to girls of school age. I am particularly endebted to them because I often use a freebie canvass bag from one of their conferences for hauling my boardgames across town. Check them out! 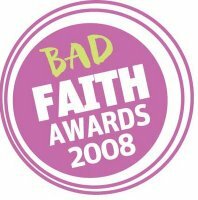 Bad Faith Awards: it’s like being asked to choose between my children! How on Earth is anyone supposed to be able to pick a winner amongst this set on bozos shortlisted in the New Humanist’s Bad Faith Awards? It makes you realise quite what a year it has been on the culture wars front. Personally, on reflection, I’ve gone for the governors of St Monica’s School, Prestwich for the simple reason that their decision to deny their pupils access to the cervical cancer vaccination is so transparently mysogynist and so physically harmful that it deserves a lot more attention than it has been getting. But New Humanist really ought to consider using a different voting system. As it stands, the high profile nominees are leading by miles while the others simply aren’t getting the exposure they deserve. Do we really need Sarah Palin to win? The good people of the USA have already found her wanting. What does it achieve letting her win, or for that matter someone like Ann Coulter who is just begging for the publicity? And wouldn’t it be better using a system which would better establish the consensus candidate? Frankly, they should be doing a death match (or, to be more pretentious, the Condorcet method). Fundamentally, it is a shame humanists aren’t using a system which encourages deliberation rather than simple knee-jerk reaction. That’s for the other lot.